was established by the Bella Vista Garden Club with the assistance of the Bella Vista Property Owners Association. Judy Jeffrey, 16 Cargill Lane, Bella Vista, AR 72715, Phone 515-371-0701. Checks should be made payable to B.V.P.O.A. Installation and dedication of the statue named "Garden Scents"
donated in Jo Hackett's memory by her daughter Jo Higginbothom. Front Row: Meredith Janes, Vera Martin, Chairwoman. The Bella Vista Living Memory Garden is truly a dream come true. One day in September 1979 a village resident, Jo Hackett, awoke from a dream she had of a beautiful garden on the hillside across from the Bella Vista County Club. This dream was so vivid and beautiful she knew she had to make it a reality. At the time this hillside was bare, dull and uninteresting and a mower-dangerous site. Although Jo Hackett was very small in stature, she was mighty when it came to a cause she believed in. This garden would belong to all Bella Vistans, not only for holding memories of deceased loved ones, but memories of special occasions like weddings, anniversaries, birthdays, or other special events. It would be fully funded by donations and all donations would be acknowledged and recorded by a calligrapher in handsome volumes of books located in the foyer of the Bella Vista Country Club. The Bella Vista Garden Club was approached with the plan of the Living Memory Garden and the entire membership was proud and happy to sponsor the garden. The Bella Vista Living Memory Garden, Inc., a nonprofit corporation, was established that planned, organized and supervised the garden in cooperation with the Bella Vista Property Owners Association that agreed to provide maintenance of the garden and manage the donations account. In May 1980 the garden was dedicated, incorporated and won first place at the State Garden Club Convention in Little Rock. It has grown larger and more beautiful as the years have gone by. Today the garden is comprised of 45 stone modules, all built over the years by Mr. Percy of Percy Stone Company of Lanagan, Missouri. The modules are filled with a variety of trees, azaleas, shrubs and flowers. Christmas lights sparkle in the garden in December. A special pink dogwood tree was planted in 2004 by the Bella Vista Garden Club in honor of Jo Hackett’s 100th birthday. Jo Hackett passed away February 22, 2005 and a special Concert in the Garden was held on April 24, 2005 as a memorial to her life and her dedication to her dream. The Bella Vista Living Memory Garden will live on and on as the dream continues. A celebration of The Living Memory Garden's 30th anniversary was held on Sunday, April 19, 2009 in spite of the fickle seasonal weather. Entertainment included: "White Wing Loft" releasing 30 doves, Jay Fishbucket making novelty balloons with the children, the Melody Lane Barbershop Quartette entertaining the guests and the Arkansas Kids singing. At that celebration an adorable bronze casting of a little girl carrying a basket full of flowers which was sculpted by Corinne Hartley in 2005 at the age of 88 titled Garden Scents, was dedicated in the garden in 2009 by Jo Higginbothom in memory of her mother, Jo Hackett. In 2012 it was determined that the garden was complete and The Bella Vista Living Memory Garden, Inc. was dissolved. An agreement between the Bella Vista Garden Club and the Bella Vista Property Owners Association was made that the gardens would be continually maintained by the POA and non tax deductible contributions can be made directly to the POA for maintenance of the garden. 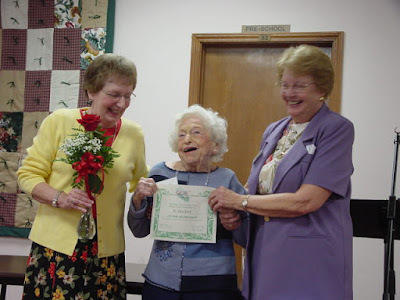 The Bella Vista Garden Club will continue to encourage and acknowledge contributions and have them recorded in the Memory Book located in the lobby of the Country Club. Some of the historical records are located in the Bella Vista Museum. you'd stroll in angel's garden, lit by everlasting love.